powerful software for reminding people to taking regular rests when using computer. Last update 4 Jan. 2011	Licence Free to try	| $25.00	OS Support Windows	Downloads Total: 375 | Last week: 4 Ranking #37 in Health & Fitness Software Publisher Rsisoft Technologies. 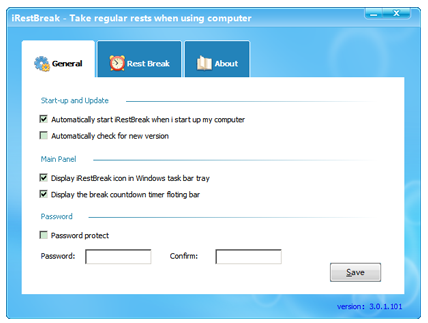 iRestBreak is a powerful software for reminding people to taking regular rests when using computer. It help computer users prevent RSI(Repetitive Strain Injuries) ,CVS(Computer vision syndrome). OOS (Occupational Overuse Syndrome),It is helpful to protect your health when using computer.